Your path to Business Agility: Do you scale Agile vertically or horizontally? 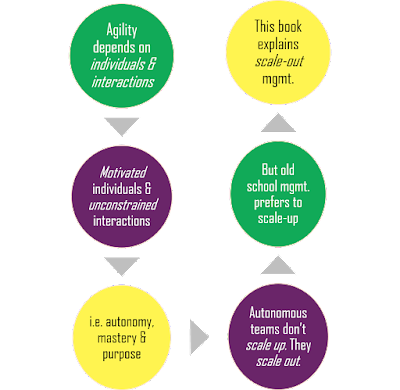 Do you scale Agile vertically or horizontally? Most attempts to scale Agile struggle because the IT leadership attempts to scale up (vertical) rather than scale out (horizontal). Scale-up is old school management. It involves context-free management by numbers, standardized metrics, reports and dashboards and workforce motivation by targets and incentives. Inside IT, this approach usually ends up scaling supervision (not management) without improving IT performance. This is why we find managers functioning as supervisors and Scrum masters functioning as taskmasters in self-proclaimed Agile enterprise IT. “Individuals and interactions” is not a marketing buzz phrase. It has to be taken seriously in the pursuit of agility. The organization has to be designed for intrinsic motivation and unscripted collaboration. Chapter three of Agile IT Org Design elaborates on this. Individuals respond to an environment of autonomy, mastery and purpose. Leadership balks at autonomy because it worries about loss of alignment with strategy and weakening of accountability. Chapters six and seven of the book explain how to allow autonomy and yet preserve alignment and accountability (using decision records, for example). This is the basis of scale-out management.